It has been over a year since the adoption of the Sustainable Development Goals (SDGs) and the historic signing of the Paris Climate Agreement. Both of these events put forward a new agenda for development, and those who work in this field have been looking into the ways to navigate in this new context. So what is happening in Sweden in this respect and how can Swedish actors contribute to the realization of the ambitious development agenda on a global level? 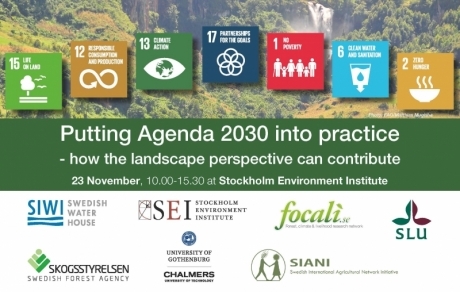 A group of Swedish actors who work with international development and environmental issues gathered in Stockholm to share opinions and exchange experience about their work on the 2030 Agenda. Why taking a landscape perspective? Anders Malmer, Director at SLU Global, provided some background for the discussion by sharing an interpretation of the landscape perspective and explained that over the recent years the landscape approach has been gaining scientific weight and public attention. This is reflected in the growing popularity of the Global Landscape Forum which has become the largest side event at the COP. Ingrid Petersson, Director General at Formas and member of the Swedish 2030 Agenda Delegation told about her work. The delegation was inaugurated by the government as a temporary authority to support and stimulate implementation of the 2030 Agenda. “Sweden has an ambition to be a frontrunner in the implementation of the SDGs. Compared to many other countries, Sweden is advanced in sustainability, but has its own challenges related to gender inequality, education and offset ecological footprints. A key strategy of the delegation is to work in participatory dialogues, with all sectors of the Swedish society.” Petersson also commended that working with integrated perspectives in mind, such as the landscape approach, can help to fill gaps and help to understand synergies and trade-offs between the SDGs. Representing Sweden’s work abroad Maria Berlekom, Lead Policy Specialist for Environment and Climate Change at Sida, continued by saying that Sweden is well-positioned to work with the landscape approach in the international context. Berlekom shared that the 2030 Agenda is now a reference point for the new policy framework on Swedish development cooperation. Sida is now going back to a more multidimensional understanding of poverty, looking at it through the prism of conflicts, climate change and human rights. This perspective integrates the vision of the 2030 Agenda with the landscape approach, said Berlekom.